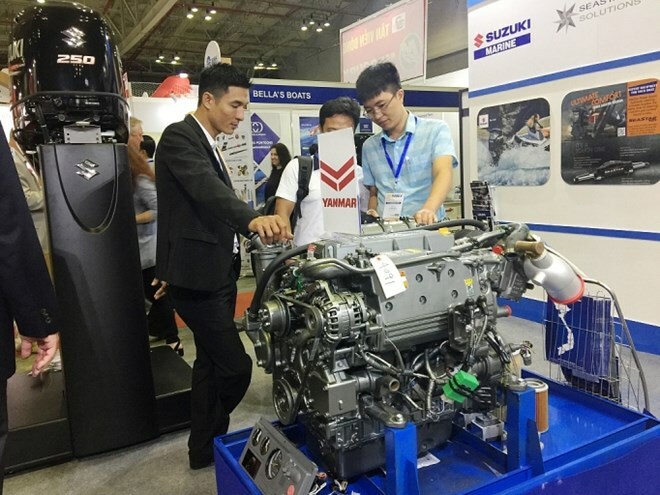 HCM City (VNA) - The International Maritime Expo (INMEX) Vietnam 2019 kicked off in Ho Chi Minh City on March 27, attracting more than 200 businesses from home and abroad. The seventh edition of the expo provides a comprehensive international business platform encompassing all aspects of shipbuilding and ship repairs, maritime engineering, offshore engineering and technology, dredging equipment, and ports and logistics. It is designed as a venue for the world’s leading maritime companies to introduce their latest products, services and technologies to Vietnam, thus gaining deeper access to the country’s market. In addition to featuring products and services by international exhibitors from China, Germany, Indonesia, Japan, the US, and Singapore, among others, this year’s event also displays products of 25 Vietnamese ship builders. According to Tom Chant, Director of the Society of Maritime Industries (SMI), Vietnam has risen to become a buoyant maritime destination which has attracted great interest from SMI businesses. There are many potential opportunities for the participating businesses to meet trade partners at the INMEX Vietnam 2019.